Lucy Furfaro is a PhD candidate within the Division of Obstetrics and Gynaecology at the University of Western Australia. Her research focuses include characterising and screening for alternative treatment options for Streptococcus agalactiae (also known as Group B Streptococcus) during pregnancy, which is a leading cause of disease in neonates. 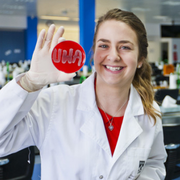 Lucy has a keen interest in bacteriophage therapy, antimicrobial resistance and clinical translation of research.